This is the standard from which most eggplants are judged. Black Beauty is a delicious 1 to 3 pound fruit. Wait until your soil is warm before transplanting outside as they will not take frost. Eggplants want a rich soil and as much heat and sun as possible. Eggplants are so versatile. Sauteed, stir fried or roasted this vegetable will pick up any flavor you want it to. These seeds are color coded with a food dye so you can tell the varieties apart. You receive seeds of Asian Bride, Charming and Farmer's Long. These eggplants are extra early and are well branched. All of these eggplants are tender and never bitter. Eggplants need very fertile soil to perform their bst. Please wait until your weather is reliably warm before planting these outside. 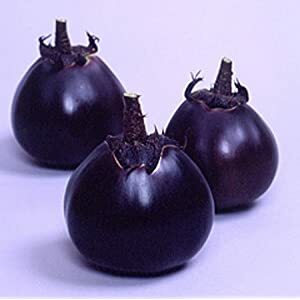 The Long Purple Eggplant is an Asian variety that is great for cooking. Its long body and thin skin makes it easy to slice. The small amount of seeds and mild flavor make it a favorite in the kitchen. This 1 gram seed package will yield 35 plants after thinning. You receive Nadia a traditional purple black beauty. Beatrice which is more oval shaped and is magenta. And Rosa, which is white and and rose and nearly round. All of these eggplants are tender with non bitter flesh. Eggplants need a very fertile soil to perform their best.